Welcome. I am a speaker and author and entrepreneur. I hope we can work together sometime in the near future. I'm glad you came by. As a speaker, I offer a wide variety of encouraging keynotes and retreats. 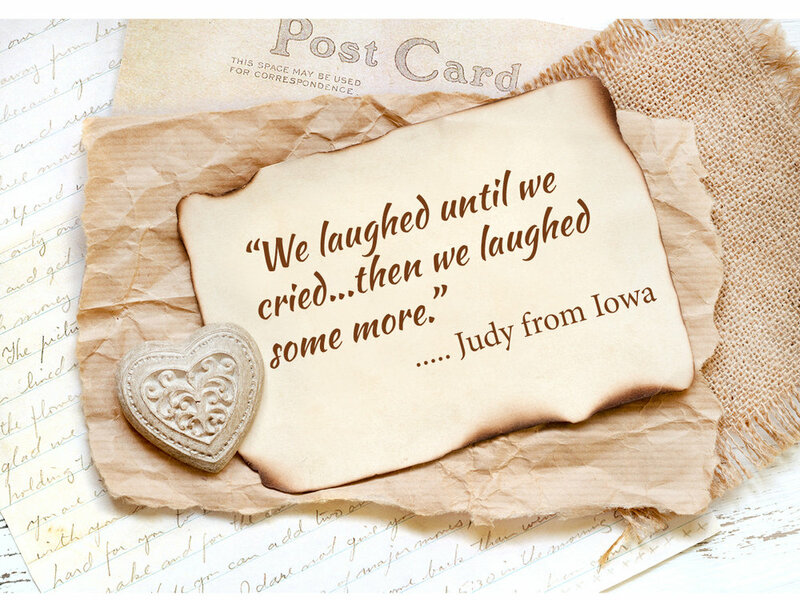 Each one is designed to make you laugh and bring you joy--but laughter is only the beginning. Together we will go deeper, learning who God is and discovering His greatness and His special love and provision for each of us. He wants you to soar! I am the founder of kae Creative Solutions, communications consulting firm and the co-owner of Bold Vision Books, a traditional publishing company. I coach aspiring writers and speakers and teach at major conferences around the country. I serve on the Board of Directors for several non-profit organizations. My marriage to George is my greatest achievement. In my spare time, I continue my life-long quest to find the perfect purse. I'd love to sit for a cuppa with you and hear your story. This message is about fighting for your life. Why did David pick up 5 stones when he only needed one? Because he had four more giants to face. The battle against discouragement, defeat, fear, and self is real, but God provides the victory. This message will forever change your life. Why Can't You Be Normal Like Me? Ever noticed that some people are different from you? 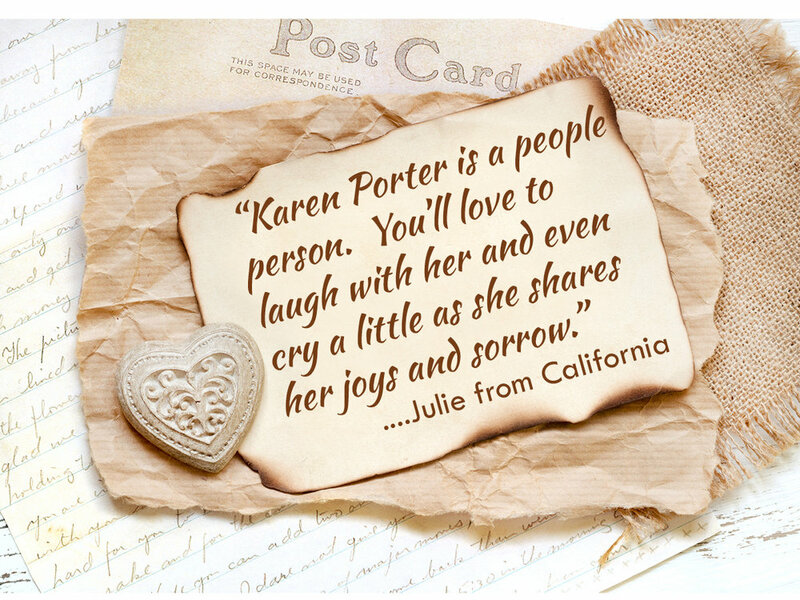 Karen will help your group learn to get along with difficult people and relate to them too. Using the tools of the LINKED Personality System, Karen will show you how to save your relationships. Full of fun, laughter, and vital information. Have a chocolate party and learn how the luscious qualities of chocolate compare with the luscious qualities of friendship. Your group will laugh and then bond like never before. Karen will send you a “chocolate kit” to help you get your party started. Using funny titles from famous country songs. Karen will help you discover the secrets of peace, love, and joy. 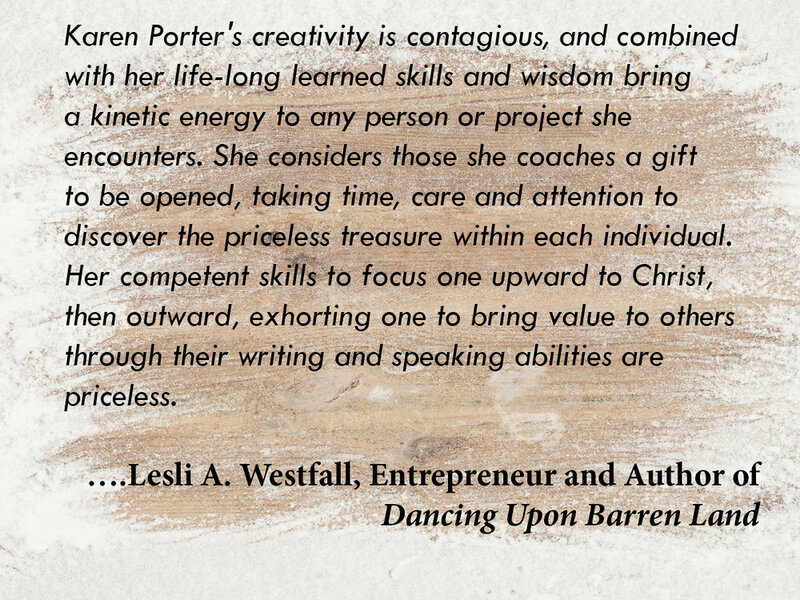 Karen is a Bible teacher and a creative communicator. and come up with a plan that will work for your group. 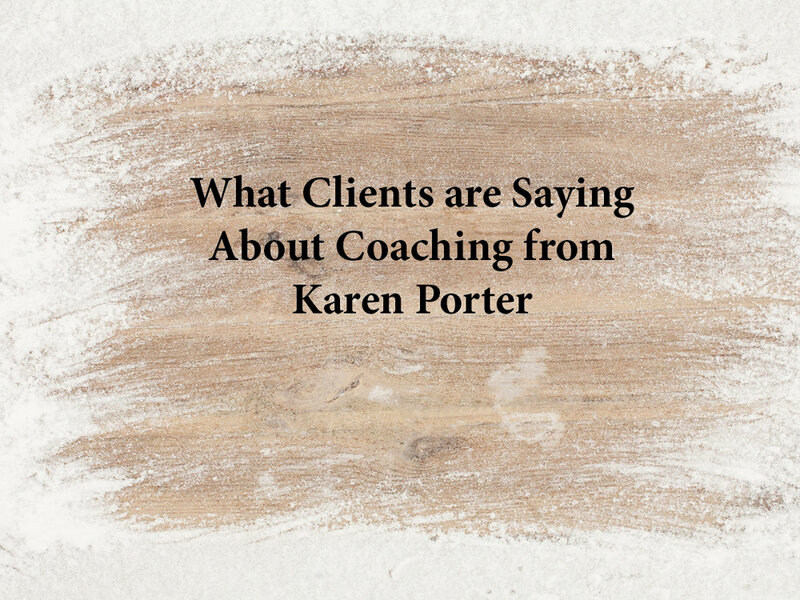 Karen Porter is an experienced, knowledgeable, and qualified coach. Writing: I'll help you develop your manuscript so that it is ready for a publisher to review. I'll teach you the writing craft, help you add materials, and show you how to shape the message into a book or article that benefits the reader and attracts the attention of an editor. Speaking: I am a seasoned coach who can help you become the best up-front presenter. If you are a pastor, teacher, speaker, or presenter of any kind, I can show you how to put together the best message to reach your audience and teach you how to handle yourself on stage. Marketing: Today, marketing is about content and offering value to your potential clients. You need not be on every social media site or spend a fortune, but you do need to be savvy and purposeful in your approach to marketing. I can show you how. If you’d like to talk about coaching schedules, content, or pricing, please complete the form. I will contact you as soon as possible.